Most of the times there is a lot of wildlife to observe when we go on Waterfall Hike in Piedras Blancas National Park but the wildlife bends with the environment in a great camouflage show and this makes it more difficult when you want to spot them in the rainforest. So you learn how to be train your eye and listen carefully to the sounds of the forest. 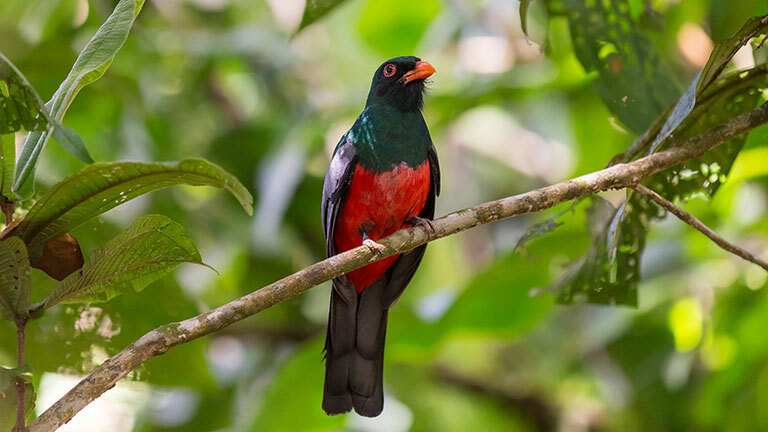 This time I was walking down the trail after swimming in nice cool water with Cheryl, Hall, Kate and Nelsy and I heard a Slaty Tailed Trogon singing but I could not see it so we all started trying to follow the singing of the Trogon from tree to tree and finally we spotted it! There it was, the Slaty Tailed Trogon with its bright colors that help the majority of times in spotting them but not this time. This Trogon is related to the Quetzal but unlike the Quetzal it only lives in low lands and they feed from insects, especially termites.